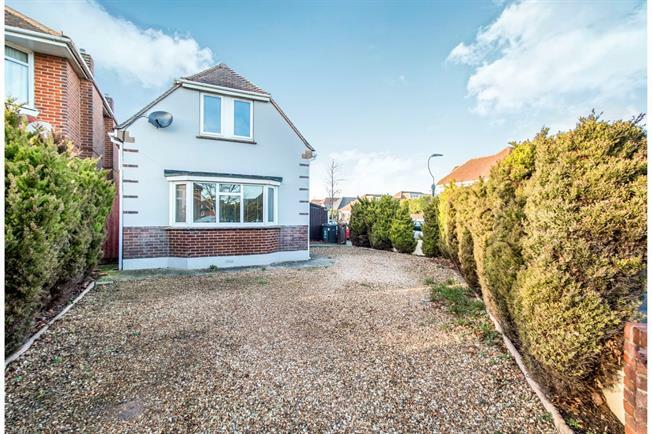 4 Bedroom Detached Bungalow For Sale in Bournemouth for Asking Price £475,000. Palmer Snell are pleased to offer this deceptively spacious 4 bedroom house with 2 bathrooms and ample off road parking situated in a quiet and desirable residential location in Muscliff close to the popular Muscliff and Epiphany Schools, Castlepoint and a short walk to beautiful river walks. The accommodation comprises a spacious entrance hall, downstairs WC, 15' lounge with wood burner, 10'5" conservatory, open planned kitchen and dining room, ground floor bedroom, 3 first floor bedrooms, en-suite and family bathroom, off road parking for 3+ cars in the front and further parking under a carport to the side, a garage and private garden. Via UPVC double glazed door. Solid wood flooring. UPVC double glazed door to entrance hall. Stairs to first floor landing with cupboard under. Radiator. Solid wood flooring. Doors to accommodation. Frosted UPVC double glazed window to front aspect. WC. Wash basin. Tiled flooring. 3 UPVC double glazed windows to front and side aspects. TV point. Radiator. Wood burner with tiled hearth. Solid wood flooring. UPVC double glazed French doors to conservatory. UPVC double glazed construction. Solid wood flooring. Power and lighting. 2 UPVC double glazed windows to rear aspect. Range of wall and base units. Sink. Space for appliances. Fitted dishwasher. Tiled walls and floor. Larder cupboard housing boiler. Arch through to dining room. UPVC double glazed patio door to rear access. Tiled flooring. Space for table and chairs. TV point. Radiator. UPVC double glazed bay window to side aspect and window to front aspect. Radiator. UPVC double glazed window to front aspect and velux. Storage cupboard. Doors to accommodation. UPVC double glazed window to side aspect and velux. Radiator. TV point. Built in wardrobe. Door to en-suite. Frosted UPVC double glazed window to rear aspect. WC. Wash basin. Shower in cubicle. Heated towel rail. UPVC double glazed window to side aspect and velux. Radiator. Frost UPVC double glazed window to rear aspect and velux. WC. Wash basin. Bath with shower over. Heated towel rail. Tiled walls. Up and over door. Power and lighting. Door to the side. The property is situated on the corner with gardens to the front and sides. To the front and one side is mainly shingled allowing off road parking for 3+ vehicles with a gate leading to the main garden. There is also a double gate to further parking under a carport leading to the garage. The main garden is private with a patio off the conservatory. The remainder is laid to lawn.